The home of America's largest city is also the largest island in the "Lower 48". 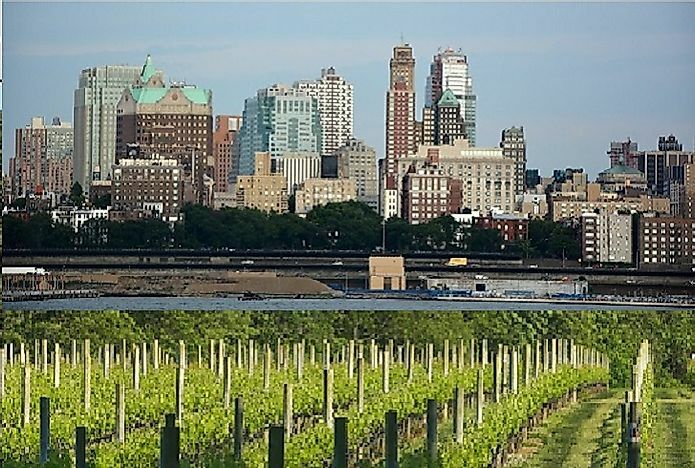 Rural vineyards in the east (bottom) contrast urban Brooklyn in the west (top) on Long Island. The biggest island in the mainland United States is Long Island, which covers 1,401 square miles. Long Island belongs to the state of New York, is located on the Atlantic coast, and is one of the most heavily populated areas in the country. Nearly 40% of the New York state population lives here, and Catholicism is the most widely practiced religion. Many Long Island residents work in the industrial park, engineering research centers, and aviation factories that are located here. The eastern side of the island is largely agricultural, and these operations have shifted towards the cultivation of wine vineyards as opposed to the potato farms of the past. In second place is the 209 square-mile island located in Texas, Padre Island. This is a barrier island in the Gulf of Mexico that has been split in two by the Port Mansfield Channel, constructed in 1964. The sections are referred to as the North Padre and the South Padre Island. On the southern end, there is a resort community that began around 1962 when the government lifted the closure and allowed settlers. Currently, 2,816 people live here. The main economic activity is tourism and it is a popular Spring Break location for local university students. The central part of the island houses the Padre Island National Seashore. The third largest island and first surrounded by freshwater, Isle Royale in Michigan is 206 square miles in area and located in Lake Superior. No permanent population resides here, however, as the entire island is protected with National Park status. Visitors can choose to stay in the lodge or the various campgrounds from where they can go boating, fishing, or hiking. The largest ecosystem here is a boreal forest filled with pine and spruce trees. Ecologists have studied the moose-wolf relationship here and in the 80’s, a visitor’s dog introduced the parvovirus to the local wolves which nearly wiped out the population. Other animals here are red fox, coyote, beaver, caribou, and red squirrel. Whidbey Island is 169 square miles in area and is located on the north side of the Puget Sound in Washington. Nearly half of the 58,211 residents live in rural setting. The northern part of the island relies on the Naval Air Station for employment whereas the southern side relies on tourism and agriculture. The island is home to several state parks and hosts numerous arts and cultural festivals throughout the year. Number 5 on the list is Drummond Island, a 125 square-mile area located in Lake Huron near the Canada border. There is a small township here with a population of 1,058. The island was occupied by British forces during the War of 1812 and was returned to US control in 1828. Coyotes, raccoons, wolves, rabbits, squirrels and moose all live in the forests. Additionally, the island hosts a rare environment called alvar, an area of thin to no soil over a limestone base and covered in grassland vegetation. Alvar environments can only be found in a select few locations scattered across parts of North America and Europe. Mount Desert Island is 108 square miles in area, and situated off the coast of Maine. The population of around 10,615 shares this island with more than 2 million Acadia National Park visitors every year. Beginning 6,000 years ago, the island was populated by Native Americans where they remained in great numbers until French and British colonists disputed ownership in the 1600’s. The British took control until the American Revolution, by 1820 colonial settlers had began a farming and lumber industry here. Today, the Acadia National Park provides refuge to 40 different mammal species. Off the southern coast of Louisiana is Marsh Island, with its area covering 100 square miles. True to its name, the island is covered in marshes and has no human inhabitants. The main activity here is fishing and part of the island is protected by the Marsh Island Wildlife Refuge where many species of ducks, geese, and other birds live. Part of the Channel Islands, Santa Cruz has 98 square miles of land area filled with sea cliffs, caves, and beaches. Once the largest privately owned island of mainland US, it is now owned by the National Park Service and the Nature Conservancy. According to the most recent census, 2 people live here full time. The Painted Cave is located here and is considered one of the largest sea caves in the world. The island is the only place where the island scrub jay and Santa Cruz island fox can be found. Martha’s Vineyard is a well known 91 square-mile island in Massachusetts, many affluent families reside here. Interestingly, it was once home to one of the earliest deaf communities in the US which developed Martha’s Vineyard Sign Language. In fact, the cases of people born deaf were 37 times the national average. the 1900’s, tourism became a major industry here and people migrated here for work. The fishing and farming industry declined. Today, the majority of the people who come here stay only through the summer, the permanent population is 16,535 whereas in the summer, it reaches nearly 100,000. Johns Island has an area of 84 square miles, making it the 4th largest island along the US Eastern Seaboard. There is a population of around 14,000 people. Once inhabited by nomadic tribes, the island has a long history and has been the site of battles and military camps in both the American Revolutionary and Civil Wars. The main economy here is farming. Tourists come to visit the Angel Oak, a Southern live oak between 400 and 1,500 years old.